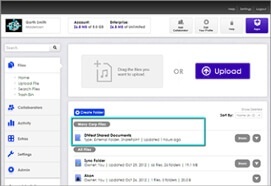 encrypted file sharing to your organization. Localized Data Storage aims to add enterprise file sharing and collaboration capabilities to businesses that are reliant upon SharePoint’s document management functionality. Integration is simple and will add tools that enhance productivity and security. Localized Data Storage will encrypt data sent to a public or private cloud, in any network. Data will be encrypted at 256 bit SSL and 256 bit AES. Localized Data Storage offers the ability to encrypt data locally, before it is sent to the cloud. This is done in the desktop sync client. Access files made available for sharing with native TAPNET applications on Android, iPhone, and Windows Phone. Sometimes you just don’t want files to be able to be shared. Localized Data Storage is unlike many file sharing tools, in that the user can select to never make it possible to share a file. This may seem antithetical to the solution, but in fact, it is necessary. Securing files in a firm means that its administrators must embrace the idea that some data just shouldn’t be able to be shared. But when files are shared, they should be watched closely. 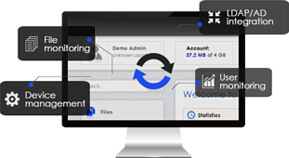 Localized Data Storage enables data stored in SharePoint to be monitored by TAPNET. Your company’s designated administrators will have access to device management tools as well as reporting on file usage and account usage. Ensure that your company’s BYOD policies are capable of being enforced when you enhance SharePoint with Localized Data Storage. Device management: Force approval of devices, even by browser, for each user. Each time a user attempts to access TAPNETfrom a new location, their access will be prevented until the device or browser is approved. Approval can be revoked at any time. File monitoring: Monitor downloads, uploads, and modifications made to files across an entire organization. Download these reports for audit trail purposes. User monitoring: Report on logins, downloads, uploads, edits and deletions by user for a specific date range. LDAP/AD integration: Connect with your LDAP/AD server to ensure that access to TAPNET and its contents is controlled from a central location. IT managers will work with Localized Data Storage’s support team to set up their first integration. 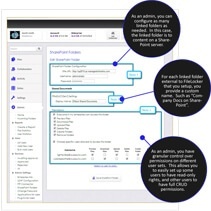 The process is a simple act of connecting Localized Data Storage to the company’s existing SharePoint server. 2. Create a unique TAPNET folder. Preferably before creating any others. 3. Select the SharePoint folders you wish to import.4. A prompt will request the SharePoint server credentials. Once SharePoint has been connected to your Localized Data Storage instance by the Localized Data Storage administrator – SharePoint content appears in Localized Data Storageas native content. User permissions: Users can read, download, preview, upload, comment, and share SharePoint content as if it was native Localized Data Storage content. SharePoint Linked Folders: Connects SharePoint data with TAPNET Mobile, and TAPNET Desktop. This allows mobile workers to easily sync SharePoint content down to their local device of choice. Localized Data Storage will add the following tools to SharePoint, enabling companies to share their files more securely and with greater flexibility.